As people get older their disks can begin to degenerate. This can cause the inner core of the disc to leak out, which is more commonly known as a disc herniation. The outer core of the disc has a weak spot which slips right on top of the root of the spinal nerve, which causes pain and leads to sciatica. In almost 90% of instances where a disc herniation takes place it will happen at the bottom of the spine at the L4-L5 vertebrae segments or the L5-S1 segments. What is Lumbar Disc Surgery? Although there are other options available to treat a herniated disc, surgery is the fastest and the most effective. That is why it is used in most cases. While patients wait to see if the pain will heal on its own there are additional procedures like undergoing therapy or taking steroids which can help manage the pain. However, if surgery is needed then there are several options possible: the most viable option usually is an open or microsurgical discectomy; another older method would be chymopapain injections used to dissolve the disc. Both are effective and should be resorted to when the patient can no longer function properly because of his back pain. However, with the advancement of technology came a new type of operation called micro endoscopic surgery which uses a tube instead of a microscope. Thanks to the progress in technology micro endoscopic discectomies have replaced microsurgical discectomies as the best and most effective operation that can be performed to fix a disc herniation. 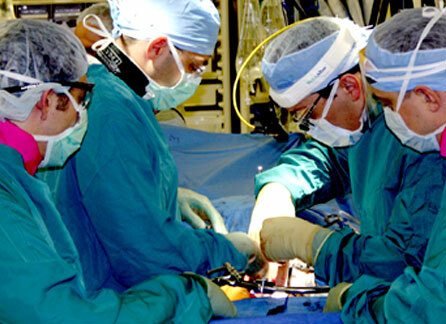 This type of surgery can alleviate the pain as well as permit the patient to leave the hospital on the very same day. A guide wire is inserted into the patient and it is pushed down until it reaches the affected zone of the disc. Using a fluoroscope the doctor can precisely navigate to make sure that the wire touches the exact spot that is generating the pain. A series of tubes in increasing size are placed over the guide wire to push apart the tissue. Over these tubes a retractor is placed. All of the tubes and the wire are then removed and a light and a camera are inserted to allow the surgeon to see. The final step is removing the spinal nerve that is causing the pain. The costs for such a surgery differ based on where you have it. However, in most cases it still turns out to be cheaper than years of therapy and drugs. All treatment methods are covered by the NHS. Most plans include therapy and medication for back pain, although some can include the surgery as well. If you choose to go to a private clinic for the surgery then pick one that is reputable like The Princess Grace Brain and Spine Centre in London or the London Bridge Hospital or a Ramset Health Care Clinic. They all have experienced surgeons on staff and such a surgery will cost you around £10,000. If you have back pain you should treat it. Whatever method you choose, it is always better than letting everything heal by itself.